Lipitor is a medication that belongs to a class of drugs called statins. Lipitor is used in the treatment of high cholesterol. The Lipitor generic is Atorvastatin. Lipitor treats high cholesterol by decreasing the amount of low-density lipoprotein (LDL) in the blood and increasing the amount of high-density protein (HDL). In general, LDL is considered to be bad cholesterol and HDL is considered to be good. Atorvastatin, generic Lipitor, is not manufactured by the company that makes the brand product (Lipitor). Purchase discount Lipitor online from www.qualityprescriptiondrugs.com at incredible prices you won’t believe. Quality Prescription Drugs.com is a recognized Canadian online pharmacy that offers competitive prices for all prescription drugs including Lipitor and generic Lipitor (Atorvastatin). 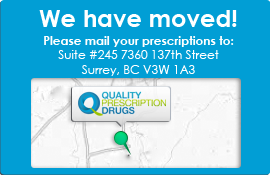 Quality Prescription Drugs dispenses products of the highest quality alone with all prescriptions filled by a registered pharmacist. In addition, Quality Prescription Drugs is certified by Canadian International Pharmacy Association (CIPA) and Pharmacy Checker. This guarantees that Quality Prescription Drugs is selling prescription drugs from a legitimate pharmacy and following all safety standards. Therefore, a prescription is required in order to buy Lipitor or its generic alternative. If you wish to talk to someone in person or if you have any questions, Quality Prescription Drugs representatives are available Monday to Friday from 6:00am to 6:00pm (PST) and Weekends from 7:00am to 5:00pm (PST). The toll free number is 1-877-244-0429. Take advantage of the great savings and buy Lipitor online at qualityprescriptiondrugs.com. There’s a reason why we are known as one of the most trusted Canadian online pharmacies. Atorvastatin (Generic) 5 out of 5 based on 8 ratings. 8 user reviews. Atorvastatin, the generic equivalent is much cheaper. I asked my doctor to switch me from Lipitor to the generic and I haven't noticed any difference except the price. I have been on a 10mg dose for more than 3 years with no problems. Recently my doctor increased my dose and I've noticed leg cramping and sore legs. The generic works for me and saves me a lot of money. Great customer service! I saved a lot of money going with the generic. So glad I found this site. The generic seems to be the same stuff, but a lot cheaper. I depend on this drug and this pharmacy saves me a ton on my prescription.